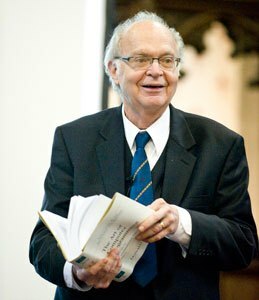 Professor Donald Knuth is widely known as the Father of Computer Science in North America, with numerous awards. He also is an accomplished composer, who has drawn inspiration from the Bible and his Christian faith. 3. Hear the Canadian premiere of Donald Knuth’s multimedia work for Pipe Organ, Fantasia Apocalyptica, performed by organist Jan Overduin. It can be regarded as a somewhat literal translation of the Biblical book of Revelation into music. Be sure to like us on Facebook. The Pascal lectures are funded by donation. Details about how to give are here.